Erica and I decided we wanted to squeeze in one last regular OTI round before the big one starts next week. This was actually supposed to happen forever ago but stuff kept happening and we kept pushing it back and here we are. Miroslava Duma. Original source unknown. Oh how I love this. The laid back cool speaks to my soul. I did this one two different ways. I put together a fun outfit last week but when I went to take pictures I discovered my lens was across town with Aaron's business partner. I took iPhone mirror pictures for M:PT anyway. Oh, this skirt. I got it on super clearance from Asos forever ago but have a really hard time wearing it. It's supposed to be a midi, I think, but it's a little too long for that. Not a midi, not quite a maxi (I think that's a Britney Spears song?). I'll hem it up someday. The scarf conveniently covered up the fact that I haven't washed my hair in...I actually can't remember the last time I washed my hair. We've been in the pool a LOT and chlorine has been doing the job for me. Also, I have a crazy sunburn on my shoulders. Par for the freckled course. For someone who has been grouching about summer for at least a month I sure have been soaking it in this week. We cut up some watermelon and grilled burgers for lunch yesterday. My skin smells like sunscreen and has that slightly sensitive feeling that comes from being in the sun a few minutes too long. I've barely changed out of my swimsuit since Monday. The only makeup I've worn is a bit of waterproof mascara I swiped on three days ago. When we collapse into bed at night it's with that deep exhaustion usually reserved for vacations and holidays that comes from playing outside in the sun and water all day. I think I might survive this summer in a single, sane, sunburned piece. Go check out Erica's interpretation and then come participate us in our link-ups over the next couple weeks! On Wednesday I got a phone call from my local grocery store. There had been a recall on the spinach I bought the week before. Salmonella! You mean, I asked, the very same spinach I polished off yesterday? Fortunately, I seem to have picked a clean batch but that was a fun few days waiting to find out. Like playing the lottery! The Salmonella lottery! On our super classy Fridate at Costco: "I don't always buy eggs but, when I do, I prefer Kirkland Organic." Me: Would it be beneath me to just do a store-bought frozen lasagna? Aaron: No! Nothing is beneath you! Doesn't Memorial Day kind of kick off swimsuit season? Did that take anyone else completely unawares and unprepared? Hold me. Our readers seem to love when we do link-ups for Open to Interpretation, so we decided to do a whole week of it! On Monday through Wednesday of the first week of June, Erica, guest blogger Grace and I will each post an inspiration picture as well as some ideas for interpreting it and making it your own. On Thursday we're going to open up a link party where YOU can submit an inspiration picture for everyone to do (and we'll vote on it! )(...we think. We have to make sure that's an option). Then, the next week we will have an OTI link-up every day! We hope you'll participate! And we also hope that you'll come away with a better idea of how you can take all those wonderfully inspiring Pinterest pictures you've got pinned and make them work for you and your wardrobe. Also, if you're thinking, "Hey, what about Amy?" -- Her life has been crazy super busy lately and she unfortunately doesn't have the time to do this with us at the moment (you may have noticed how quiet her blog has been lately!). We're very sad and we miss her beautiful face! We're so glad that wonderful Grace is able to step in and lend a hand! Everything I know I learned from (free) online tutorials. Want to know how to do something specific? Google it. That's how I eventually found this website, which has lots of great tutorials (as well as a list of blog designers, if you're feeling like you don't want to tackle this beast on your own). There are a lot of people out there who actually know what they're doing and they're willing to share their knowledge with the world. As opposed to me who has no clue but is pretending to be an expert anyway. For research purposes I have been spending some time with Pixlr and have been super impressed. For my example design I'm going to use Photoshop but you can do just about everything I'm doing in Pixlr instead (which is freeeee). If you're wanting to do your own design and don't have Photoshop, I recommend you hop on over and start familiarizing yourself with Pixlr and its capabilities. Also, it has come to my attention that stuff I consider basic common knowledge is perhaps not that basic and not very common. I'll be writing my tutorials accordingly (and likely including a lot of outside links to people who have already explained things better than I can. Explanatory links will be marked with *). If you know some HTML and stuff then some of it will probably be old news to you. .psd - layered* Photoshop file. Pixlr has an equivalent (.pxd). I probably won't be talking much about these but if you're creating elements for your design, make sure you save two versions. A .psd (or .pxd) that has all the layers (which makes for easy editing later if you need to make adjustments) and a .jpeg or .png for uploading. 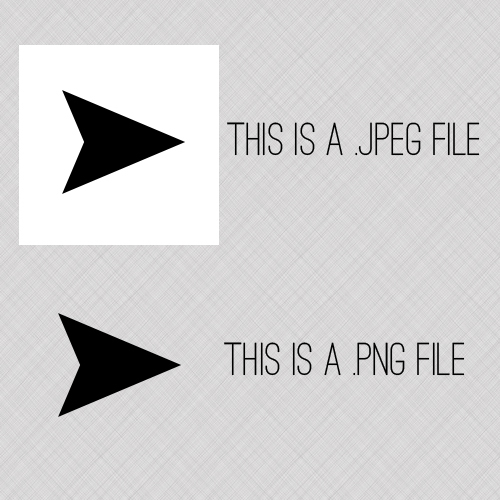 I want to very quickly address .jpeg vs .png files. If you have a non-rectangular shape and save it as a .jpeg file then it will automatically square itself off and give itself a white background. A .png file will have a transparent background. These arrows are the same, but I saved one as a .jpeg and one as a .png then put them on a patterned background. I'll be working with both types. Also, just FYI, I've noticed that Blogger supports .png files on the design side but NOT in blog posts themselves. As soon as OTI wraps up (more about that tomorrow!) I'm going to take you through a blog design, step by step. I held a kind of impromptu giveaway on my Facebook page a couple weeks ago and randomly selected a winner to get a free blog design that I could use as an example. It's shaping up to be a pretty awesome design so I hope you'll come check out the process! A while back I did a series called So You Wanna be a [Fashion] Blogger. I got more emails from that series than anything else I've done on this blog. Mostly, people wrote to me about my suggestion to dress up your website. I spent most of that weekend helping people assess their blogs and directing them to resources that would help them create a prettier, more user friendly space. I've been meaning to do a series on DIY blog design ever since then but I'm only just now getting around to it! Faux Freckles in April. I prob wouldn't read this blog. Big, ugly, self-important header. Very little visible post underneath. There's nothing to keep me here. The area of your blog that is visible without scrolling (aka above the fold) is valuable real estate. 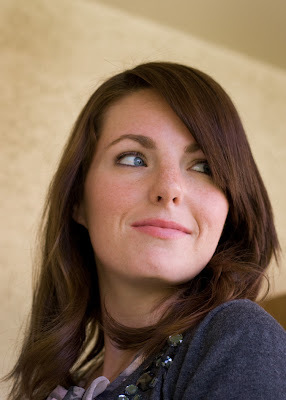 You want that section to hook your reader and draw them further into your blog. Your header is part of that but it shouldn't take up the whole space; keep your header a little on the smaller side so some of your content is visible to draw the reader further in and down. Real Freckles in April (from December). I am intrigued! I will, at the very least, read the first post. I recently clicked over to a blog where the ENTIRE first screen was a picture they had inserted into their header space. I spent a couple seconds wondering where the blog itself was before I realized I was looking at a header and just needed to scroll down. But by then I had already lost interest. You have 3-5 seconds to hook potential readers. Make those seconds count with a solid first impression- a good header and a tantalizing bit of post they will want to stick around and read. My dad once explained to me that people like thinking there's somewhere to go. The best outdoor spaces have nooks and crannies or little paths to follow, things that make you want to walk over and explore. Your blog is the same way. When a visitor has read some of your content and they like what they see, give them a few other options to poke around within your blog. 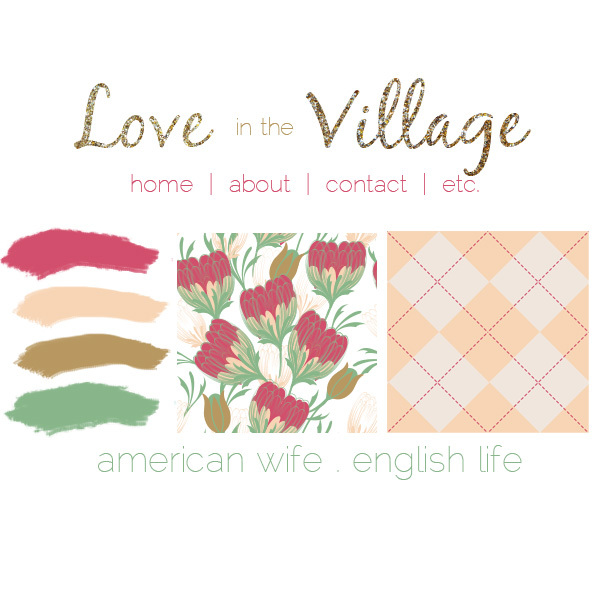 An "About Me" page so they can get to know the voice behind the blog, contact info, subscription options, etc. A few (not too many!) useful places to click over and explore real quick. Then, give links to outside stuff that is still you. AKA your social media accounts. All of this should be above the fold (or at least partially above). It doesn't have to be fancy (I love the way Angela has hers), but don't make people dig to find your social media. Keep it grouped together and easily accessible somewhere near the top. Ah, side columns. You'll find a lot of different opinions about how you should use your side columns but I try to keep them as minimal as possible and very functional. I used to have a left and right column that I filled to the brim with stuff. Then I realized that it made my blog look overwhelming and cluttered and I think it was contributing to a high level of bounce traffic. I did a serious analysis- what did I really need in my sidebars? I pared it down to the essentials (a couple navigation options, search bar) and was able to change my layout to a single side column, which allowed for more posting space in the middle (and thus, larger images) and a cleaner looking blog. Keep your sidebars intentional, organized, useful and free from extra fluff. Keep in mind that you can always use a page to hold stuff if need be. I created a page specifically for my favorite links because the list was taking up a ridiculous amount of sidebar real estate. Next Up: Getting started on your design. Do you have any specific questions you'd like me to tackle in this series? Send them over! I adore Reachel of Cardigan Empire. I've had the pleasure of meeting her in person a handful of times now and I can attest to the fact that she is even more wonderful in person than she is on her blog. I love her guts. Last year she asked if I would be willing to contribute a post to her Beauty-Full Tuesday series and I was thrilled to be included. It went up on her blog back in August of last year but I just found the post hidden in my unpublished posts and I thought I'd like to share it here as well. Enjoy! My figure is the opposite of hourglass. My nose is weird from a break when I was a kid. My skin is and has always been a battlefield. My nails are flimsy and sad looking. I have split ends. The older I get the more difficult it is to summon up my old teenagery angst over my flaws. I've learned to dress for my shape. I've gotten over my nose. My skin still annoys the crap out of me but I doubt I'll still be breaking out at age 50 so at least that has an expiration date. And at some point between the black self-esteem hole of high school and now, I've decided that it's ok to think that I'm beautiful. For some reason I was always afraid to let myself think so highly of myself. What if I was wrong? What if other people disagreed? As it turns out, other people are kind of busy with their own issues so I gave myself permission to think that I'm pretty and awesome and superwoman and a hundred other good things. And, like so many things in life, you become what you think about. As soon as you let yourself think you're amazing you will be. Just in case he's forgotten, I occasionally like to turn to my husband and say, "Aaron? I'm pretty." 1. If you bought stuff from my blog shop last week I got MOST of it shipped this weekend. I still have one or two boxes that need to go out plus a couple orders that I still need to bill and get shipping info, but I'm almost there! 2. 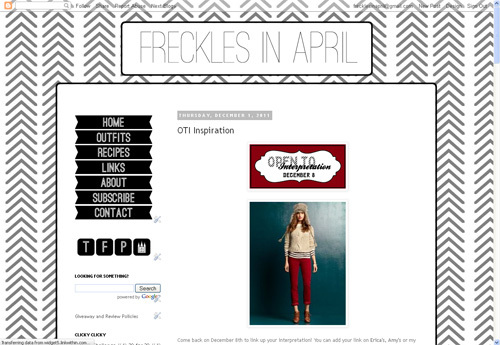 My little blog hit a grown-up milestone last weekend- I'm now FrecklesinApril.com! I have my own domain! I feel so very official now. It was $10 and about 30 seconds. I went through Blogger itself and everything transferred (including my feed) and I had to do nothing. It was the easiest thing ever. If you're on the fence about it I recommend doing it, if only for the feeling of legitimacy. 3. 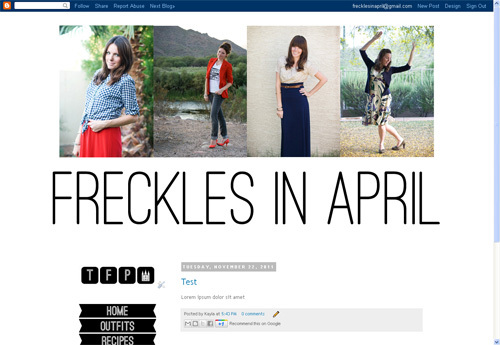 Remember the JCrew shirt I blogged about? My in-laws gave it to me for my birthday! And I LOVE it. I even wore it on the first day of M:PT! 4. Speaking of, I'm doing Mission: Put Together on Flickr but I doubt I'll bother posting any of my pictures on here (too busy + too lazy). You can find my set here or the whole group here if you're interested! I'm totally getting spoiled by how quick and easy it is to take awful iPhone pictures into a mirror, by the way. How do you go back after that?? This is probably the only thing I'll get up on the blog this week due to a very long to-do list. If you feel the need to see what I'm up to, there's always Twitter, Facebook, and Instagram. Enjoy your Wednesday, Thursday, Friday and weekend! 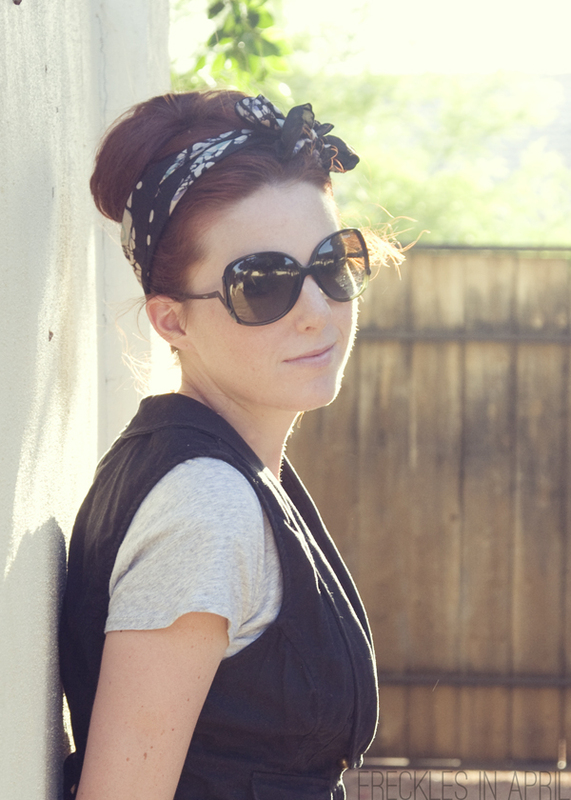 I first started doing fashion posts to help me pull myself out of my post-baby slump. I carried a few extra pounds around for a while after Baby 2 was born and I had a really hard time getting dressed. I frumped around in sweats a lot of the time and my self esteem took a serious hit. This blog and doing 30x30 forced me to, at the minimum, take off my yoga pants. It held me accountable. My outfits at the beginning were terrible but at least they weren't pajamas. And knowing I'd be taking a picture made me want to take regular showers, so I was making leaps and bounds from the get-go. It's been about a year and a half now and I get dressed and feel pulled together almost every day. My brain is starting to think in terms of figuring out and defining my style and then planning my wardrobe accordingly. I've never been interested in that before (too much work) but lately it sounds like a good approach. I like the idea of having an intentional wardrobe- something I've put thought into, pieces I've picked up because they fit into the big picture, having a more signature style. The No-Brainer Wardrobe by Hayley Morgan - Janssen recommended this cheap, quickie ebook and there was so much good stuff. The focus here is making sure that your wardrobe only contains items you'll actually wear and that you'll be able to build outfits with quickly and easily. Immediately after finishing it I dove into my closet and did an honest and merciless edit. About half my hangers are now empty and I feel really good about that. This one is worth reading- especially if you're low on time. You'll be able to finish it in an hour or two and the whole thing is broken down into easy action items. You can put a couple on your to-do list and work on them when you've got a few minutes. I read this one first and it really was the perfect starting point. I'm really drawn to things with a little edge. A moto jacket was priority one for me for almost a year before I finally found my Gap one. And remember the Zara jeans? I have had actual dreams about them. I love black and hardware and all of that. Except there is absolutely nothing about me that is edgy. I have never been on a motorcycle (they're terrifying death traps) and I only listen to rock n roll in passing when it's on the radio, so I tend to shy away from stuff with studs and whatnot because I feel like an imposter. The quote above helped me to see that the stuff I'm drawn to doesn't have to reflect the actual me, it can reflect the fantasy me who is kind of a badass. 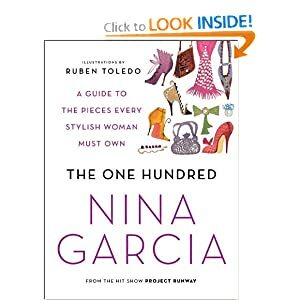 After finishing that one I moved on to Nina Garcia's The One Hundred . If you're the type of person who wants an itemized shopping list of essentials then this one is for you. There was a fair amount here that didn't apply to me (I will never have need for an evening gown, no matter what Nina Garcia says) but there were quite a few that had me going, "Oh yeah...duh." and then scribbling it down on my list. I now have a list of 25 items to give me shopping direction. It will take me years to get them all (especially because I want to get investment piece versions of a handful of them, which means saving my pennies) but all of them will still be basic style essentials whenever I get around to buying them so I can take my time. 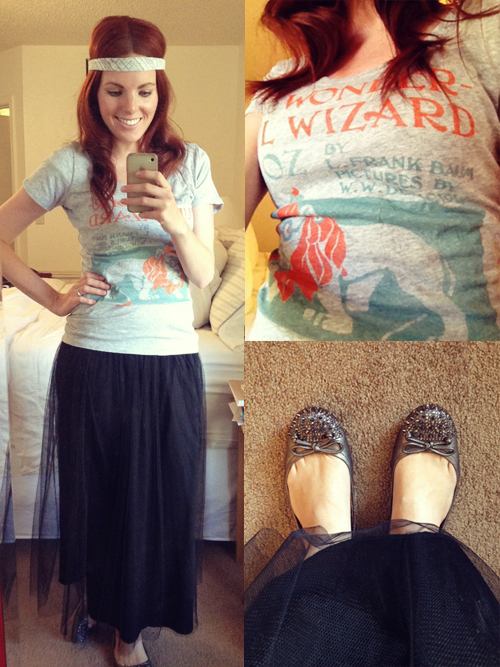 Do you have an intentional wardrobe? Do you shop with purpose or just look for something to strike your fancy? Do you have a signature style? 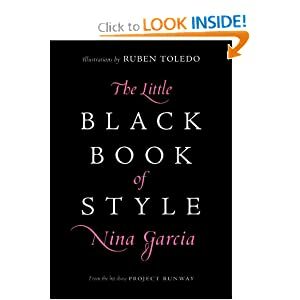 Do you have any style books you can recommend?